THE DEXTER HOUSE I'm dying to try out recessed drawer pulls for the cabinets at the Dexter House. They're a pretty spendy option as far as drawer hardware goes, but oh so lovely! Installing this style pull is tricky since they require a router to recess the hardware into the drawer front, BUT we just so happened to get Papa a router for Christmas last year. Coincidence...I think not! Once I set my mind to recessed pulls (also called campaign hardware), I turned to Pinterest. 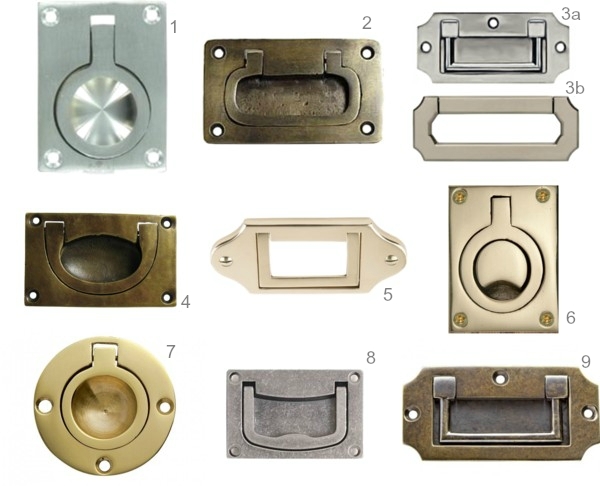 I spent hours scouring pictures and doing key-word searches looking for the best recessed pulls and where to buy them. What I found out is that recessed pulls are just not that common in kitchens and it launched me on a search that ate up a good four hours of my Saturday. But I did find some really lovely hardware and I'm going to round up my favorites here (including two faux options in case you don't have a router). These suckers are pretty spendy, but they are such a unique, old-school, and beautiful hardware option, that I think they're worth it!